SYSTANE™ Lid Wipes Eyelid Cleansing Wipes offer a gentle wipe as part of a daily regimen recommended by eye care professionals, removing debris and eye makeup that can cause eye irritation. These premium pre-moistened eyelid cleansing wipes are hypoallergenic, non-irritating and soothing. 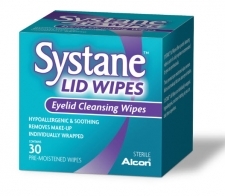 And because each wipe is individually packaged, SYSTANE™ Lid Wipes can be taken anywhere and remain sterile until use.